The first time I saw Gwar was in 1995. The band of interplanetary warriors was featured on Beavis and Butthead, and I was watching (even though I wasn’t supposed to). Today, a Gwar slave at a TED Talk explained to me how the band expressed its history in the poverty-stricken South with dark themes like death and slavery and intergalactic mayhem. And you know what? It makes total sense. Gwar was founded Richmond, Virginia in 1984. It was actually the marriage of two separate art projects unfolding at the Richmond Dairy, a sort of proto-Bushwick artist colony in one of the city’s worst neighborhoods. Dave Brockie and his band, Death Piggie, crossed paths with Hunter Jackson, a fellow art student at Virginia Commonwealth University, and the two decided to make a movie about bloodthirsty barbaric space aliens who land in Antarctica. One thing led to another, and before long, Death Piggie had evolved into an act called Gwar (short for “Gwaaarrrgghhlllgh”) and a whole pack of artists from Richmond were touring the world in elaborate costumes, spraying the crowd with fake blood and death metal. The collective that produces GWAR is called the Slave Pit. The band’s new bassist, Michael Bishop, explained this history to an audience at a TEDx event in Richmond recently. “The people who work for Gwar are slaves of Gwar,” said Bishop, who has a Ph.D. in music from the University of Virginia in addition to an awesome career as a badass bassist named Blothar. It’s easy to see how these kinds of terms connect with Richmond’s unique Southern identity—namely its history as the capital of the Confederacy and current status as the capital of the tobacco industry. Indeed, slavery shaped the city’s history. Bishop elaborated how Gwar’s hometown of Richmond had been particularly affected by white flight, bad policy, and defective urban development. What he was talking about there was the Civil War and tobacco. The Civil War made Richmond, Virginia a city of mass graves. A horrific struggle happened here, and you can’t erase that energy. A lot of death happened in this city—terrible violence—and the narrative of that history is contested, and that’s one of the ways that Richmond is known on the world stage. So that’s dark. But have you ever seen Gwar perform? It’s equal parts absurd and amazing, turning the death metal trope on its head or cranking it up to its most extreme degree. It’s hard to tell because there are so many layers to the performance. They’re all there for a reason, too. 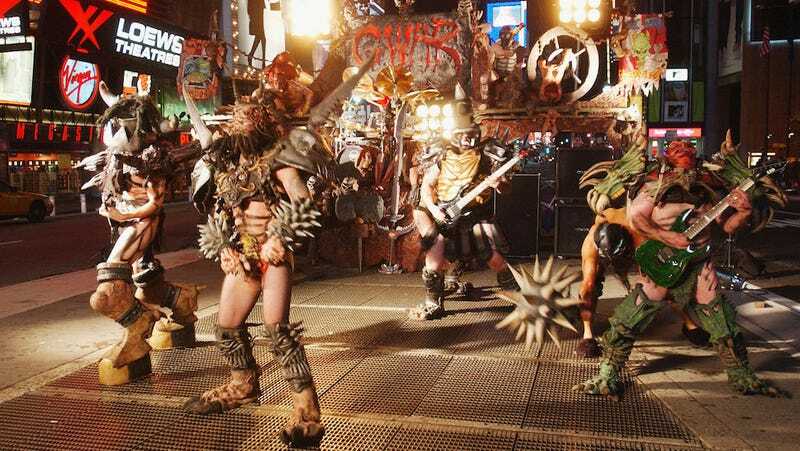 Oh yah, and about that Gwar music video on Beavis and Butthead. It was this one, and it only gets better the deeper you fall into the Slave Pit.